When I'm on holiday I like to try and eat in local independent places and sample experiences that are unique to the place you are holidaying. When we were staying at Ready Camp in North Yorkshire recently, I stumbled upon The Fairy Garden and knew we had to visit. The Fairy Garden is part of the Centenary Way Campsite in Filey and is a little off the beaten track. The Fairy Garden is open to non-residents but I would always message them on facebook before visiting as they only open in the Summer months and when the weather is suited to outdoor dining. We parked in the designated garden car parking spots and were immediately enchanted with the garden. Isn't it sweet! We selected a table and browsed the menu as the children looked around in wonder at the beautiful elves and fairies that decorated the space around them. We loved the special fairy reading corner which is a sheltered area of the garden filled with cushions and a box full of fairy-themed books for children to help themselves. Drinks and homemade cakes and snacks are available to order from the quirky caravan at the top of the garden. Steve ordered a homemade fruit scone and cup of tea deal (only £3), the children ordered 3 chocolate brownies and Harry also ordered a ham sandwich. I couldn't resist a slice of homemade carrot cake and fresh raspberry milkshake and the children all ordered squash. Our bill was only £12 in total. BARGAIN!! Our food was absolutely scrummy and you can tell it was made with love. Also how cute are the children's juice cups! Fabulous attention to detail. There are bird spotting sheets pinned to the garden wall and the garden is a little haven for wildlife. We spotted 4 different species including this rather handsome Robin during our short stay and we were only in the garden for around 40 minutes. We made a little 13 second video which gives you a little bit more of a feel for the place. I hope you enjoy it! 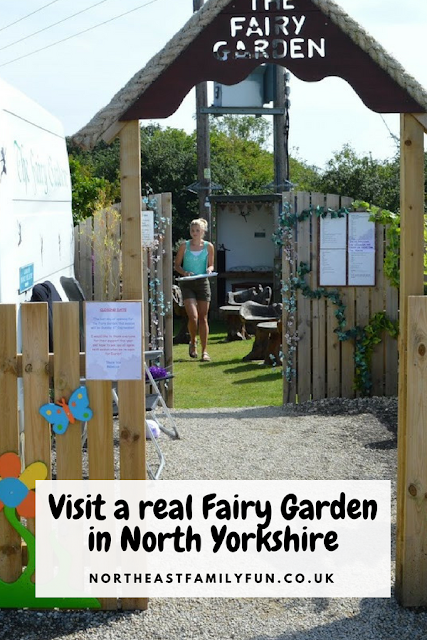 The Fairy Garden will be sadly closing in the next few days (if it hasn't already) for the season but make sure you give them a 'like' on facebook and pay them a visit next Summer if you are visiting NorthYorkshire. It is such a unique place to stop for tea and cake and your children will love it too. Aww! What an adorable place....So cute!! The prices are fantastic too! Such a cute little place, my kids would love that Sam. Top Tip for next time we are over that way. What a cute spot - perfect with kids too. Visited today after seeing your review a while back, really enjoyed it. Very pretty little place.